Neil Powell says the Blitzboks have to put their tournament win in Canada behind them and focus solely on the upcoming challenges at the Hong Kong Sevens, writes MARIETTE ADAMS. 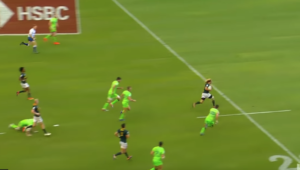 By their own high standards, the Springbok Sevens side have had a substandard season. They finished sixth in the opening tournament in Dubai, third in Cape Town, fourth in Hamilton, fifth in Sydney and seventh in Las Vegas. It was the Blitzboks’ longest sequence of tournaments without a semi-final appearance under Powell’s reign. 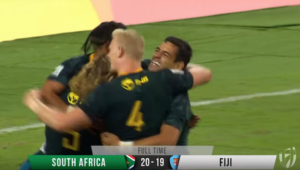 But they came good at the Vancouver Sevens three weeks ago, beating Argentina in the quarter-finals and bitter rivals Fiji in the last four, before edging France in the title decider. For a confidence-deprived Blitzboks side, the overall performance and the result provided a much-needed boost as they head into the last four events of the season. But Powell has warned his charges against reading too much into their success in Canada. ‘That we were successful in Vancouver lightened the mood in the camp. 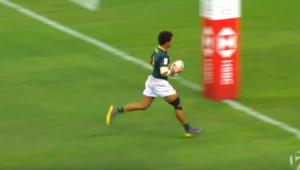 But there’s a difference between confidence and arrogance, and hopefully our guys gained confidence from that win in Canada, and not arrogance,’ Powell told SARugbymag.co.za. Powell said because of the short turnaround between the Hong Kong and Singapore tournaments, the team’s preparations before their departure to Asia were fairly specific. ‘We touched on the overall structures and systems, just to sharpen up in defence and attack. The focus was to maintain our conditioning and fitness, and on some unit skills like lineouts, scrums and aerial skills,’ Powell explained. 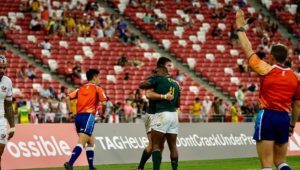 The Blitzboks’ first pool game in Hong Kong is against Japan at 12:06pm on Friday, followed by matches against Scotland (5:41am) and Samoa (9:22am) on Saturday.